At the risk of paraphrasing the musical, “Rent,” I want to pose a serious question: How do you measure the size of a menu? In appetizers? In entrées? In dim sum and ramen? Perhaps more to the point, how big is too big? Twenty dishes? Two dozen? Three? SERVING: Sunday & Monday, 11:30 a.m. – 9 p.m., Wednesday to Saturday, 11:30 a.m. – 10 p.m.
RESERVATIONS: Yes. Call for more information. BOTTOM LINE: When Empire Chinese Kitchen opened in 2013, chef/owner Freeman Chan made a prediction to his daughter. 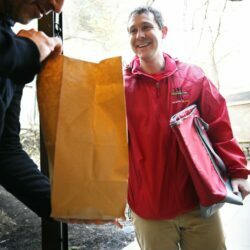 “Just watch,” he told general manager/owner Theresa Chan, “In three years, there will be five more East Asian restaurants in Portland.” His prediction came true, and then some. With so much competition, Empire has made adjustments to its once-concise menu, inflating it from eight dishes to nearly 50. Among these are several insipid Americanized dishes. Don’t bother. There are also a few standouts, like crisp-tender wok-sautéed bok choy, super-savory dry-fried green beans and roasted strips of long-marinated pork loin roasted hot and fast. Dim sum dishes are generally good, especially fat, aromatic har gow and golden-crusted, pan-fried bao hiding ginger, chicken and bok choy. If you have time or noise-tolerance enough for only one dish, make it the beef and handmade broad noodles. Simple and beautifully balanced, it is a perfect encapsulation of Empire’s strengths. Empire Chinese Kitchen, one of Portland’s most consistently popular restaurants, now offers a menu that tips the scales at four dozen items, plus a few specials. Things weren’t always this way. When the restaurant opened in late 2013 – about six weeks before this paper awarded it four and a half stars – Empire featured a sharply focused menu of eight dishes. I wish I had visited then. Instead, I waited 18 months. 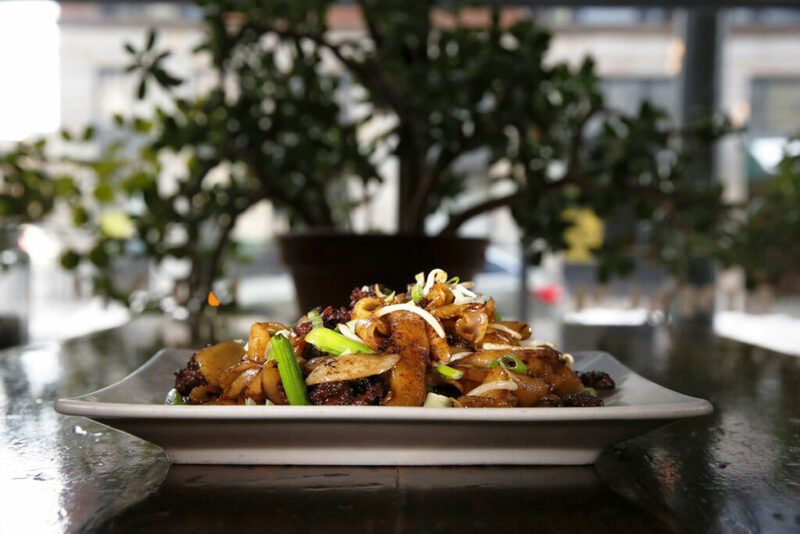 By then the list of what co-owner and general manager Theresa Chan calls “contemporary Southern Chinese” dishes had long-since begun distending to its current size. But then, as now, I am sure I could have picked eight stellar dishes from the bloated list. The best place to start is with vegetables. Especially when stir-fried, they are one of co-owner/chef Freeman Chan’s strongest suits. Take his sautéed bok choy dressed with white pepper and oyster sauce ($6), a dish whose simplicity shunts your attention toward the lovely balance of textures: crunchy stalks against tender, delicate leaves. Or dry-fried green beans ($6), a small portion of still-crisp beans that have been flash-fried with tamari, sweet onions and garlic. Savory and slick with vegetarian oyster sauce, they are impossible to resist. Ask the kids greedily eating them at the table next to mine. Even the Chinese eggplant in sweet-tart garlic sauce ($8) – best eaten spooned over a bowl of sesame-seed-dusted white rice – is a pleasure, despite having absorbed a glug or two too much oil during its time in the wok. Traditional dim sum dumplings and buns, the purview of Theresa Chan’s grandfather, Li Bing Tian, are also largely top-notch. My dinner guests at a recent visit couldn’t get enough of that night’s special bao, billowy stark-white parcels of steamed dough stuffed with ginger, bok choy and minced chicken ($8). After they’ve puffed up, the kitchen pan-sears one side until it goes toasty and golden. 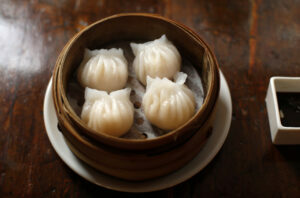 Empire’s har gow ($9), chubby, clear-skinned steamed shrimp dumplings, might be the best dish on the now-expansive menu. Surrounding a sticky filling of bamboo shoots and chopped shrimp is a house-made crystal wrapper – a pasta of sorts made from potato and tapioca starches that are kneaded together with roasted shallot oil. As the har gow cook, they release volatile compounds into the clouds of steam that surround them. 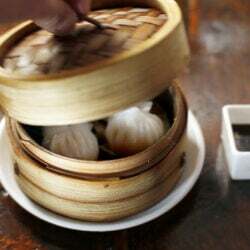 And when they arrive at your table, opening the bamboo steamer unleashes a scent like tramping through a field of wild onions on a sweltering summer afternoon. Not all the buns are as pleasingly evocative. Banana-chocolate bao ($6), one of the restaurant’s few desserts, is an unpleasantly greasy duo of dough balls packed with Nutella spread and sliced banana. They tasted like something you might eat at a carnival, then quickly regret. Perhaps we should have taken the hint from our server, who, when we inquired about desserts, started his reply with, “Really?” But we assumed that was just part of his brusque, often grouchy approach to service. Sort of. “Yum cha” might literally mean “drink tea,” but it is used to represent the experience of going out for dim sum, of making a meal out of lots of small plates and pot after pot of tea. As he delivered drinks to our table – including a candy-sweet Pink Flamingo ($8), a sparkling cava, yuzu and Chambord concoction he promised was the least-sweet cocktail on the menu – he launched into his well-rehearsed spiel again. 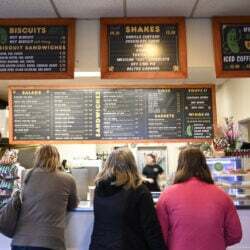 We nodded politely and placed our order, duly cautioned about the process. When he reeled off the same minilecture a third time, we rolled our eyes, then burst into laughter when we heard him start all over again at a nearby table. We were lucky we were able to hear him at all, because Empire’s dining room of exposed rafters, ductwork and hard surfaces (including a sauce-spattered glass door salvaged from a jewelry repair shop) can get calamitously loud when it is full. On nights when there is live music in the owners’ adjoining event space, it contributes a further layer of clamor. Not fixing the noise problems is a puzzling choice, as is the decision to expand the menu by incorporating several American-Chinese dishes more suited to a food court than to an ambitious, occasionally elegant restaurant like Empire. Plates like Kung Pao chicken ($16) and orange beef ($13) seem entirely out of step with the rest of the menu. A few, like dark, smoky chicken marinated in plum sauce and cooked “teriyaki”-style ($15) are solid. Others are not particularly well-executed, like wrapper-heavy spring rolls served alongside a fistful of wilted arugula ($6), or a version of honey walnut shrimp ($11) made with so much sweet Kewpie mayonnaise, yuzu and sweetened condensed milk that it tasted like a Waldorf salad made with deep-fried shrimp. I like to imagine that Empire’s true heart beats through dishes like Chinatown pork ($9): thin strips of marbled loin that has been marinated for an entire day in honey, hoisin sauce and roasted shallots. Or better still, the finely equilibrated beef and broad noodles ($16), a dish that could only have been prepared by someone who is both an engineer and a chef. On a bed of wok-sautéed, knife-cut rice noodles that Freeman Chan rolls out every day, sit thin strips of flank steak, bean sprouts and pointy-tipped scallion batons. “To do it well, you have a really small window,” Theresa Chan said. “It’s like a pizza, in that there aren’t many ingredients that go into it. It’s simple, but not everyone can do it. He does.” Co-signed. 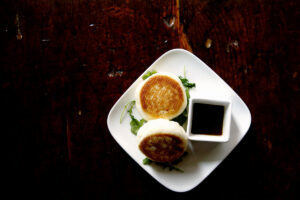 Forget the syrupy, deep-fried dishes, the Nutella-filled buns and over-sweetened cocktails. Look for it, and you’ll find Empire’s secret menu hiding in plain sight. Just let the promise of simplicity guide you.